Funny Valentine's Love Anniversary Rustic Modern Card "I Love You and I Like You"
Love it! Price is awesome given how big it is. Great quality, would definitely order again! Go Blue / Hail Yes / Michigan letterpress poster. Maize and Blue. Oh snap! 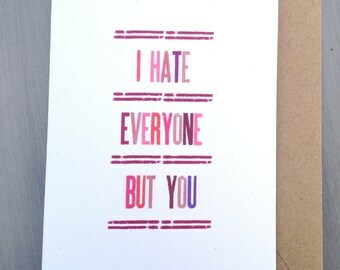 New Valentine's Day card from Brain Surgeons and Rocket Scientists. Cards and stuff for the rest of us. My name is Aimee. I’m a freelance writer / creative director. A sometime-runner. And I used to be a full-time ad girl. Just like Peggy on Madmen…but with more comfortable clothes. I just make cards I like. Thanks for checking the shop out! STUDIO CREDIT: I rent press time at a very cool place called Spudnik Press Co-op in Chicago. That's where these photos were taken. Owner, Maker, Designer, Founder, Etc. I love stationery, writing notes, getting mail, big old heavy dirty letterpress machines, Michigan football, working out sometimes, and hot pink. Roo was a rescue Border Jack who didn't care if I used hot pink or blue or teal or grey because she was a dog and couldn't see colors. Roo was a founding partner of BS&RS and sadly died of the cancer at age 3. RIP Roo Roo. Louise is an Australian Cattle Dog rescue and she likes to snore, grunt, and eat paper trimmings. Louise would also like to go to the studio to help me print, but as of yet, dogs are not allowed. Till then, she is content to chew on delivery boxes. Raylan Givens (Ray Ray) is a Platinum Solid Tonkinese. He is a big fan of the paper cutter, and would really like to have his head or tail cut off, apparently. He also likes to eat scrap paper and sit on stuff. Welcome to Brain Surgeons & Rocket Scientists' store policy page. It's very exciting. I accept PayPal, and PayPal accepts all major credit cards. Or etsy direct pay accepts credit cards too. Super easy. Orders ship (leave my hands) within five business days of payment. Usually earlier, but sometimes, you know, life happens. Orders ship USPS first class, which takes 3-5 business days. So, you're going to want to order at least 10 business days before you need it. I generally ship without tracking to keep costs down. But you can add tracking for $1, it's listed as an item in my shipping section. If you would like expedited shipping (in the US), I can send things Priority Mail, which costs an extra $4 dollars for a standard card order (up to 10) and gets it there in 2-3 business days. I have an expedited shipping listing in my shop that you can add to your order. Each unique address incurs its own shipping charges. Sorry. No. It's just way way too expensive to do custom letterpress for one-off orders. Trust me. BUT, I'm working on some custom offset options. (much more affordable printing) Coming soon.